This has been an emotional roller coaster of a week. I've decided to never ever buy another house ever again. Ever. We are going to die in this house. I never want to deal with all the garbage of getting another mortgage. It's not worth it. The stress alone is not worth it. We are waiting on one last signature before we get our clear to close. I would love to have that done so I don't have to worry about it over the weekend, but it's not my call. I get to stew about it. And fret. Hopefully sleep, but I doubt it. The highlight of the week was hopping on a chat with HGTV's David Bromstad. Kat gave me two large custom made cubbies she had no use for and I needed help with the paint colors. Plain white just doesn't work for me. 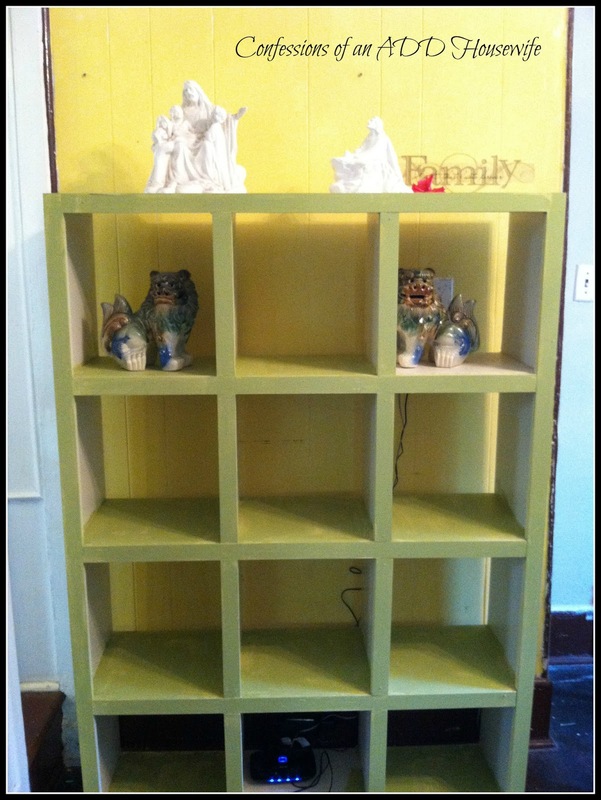 David suggested painting the shelf either Sassy Green or Frolic. He said it would look "organic." I already had a can of one of those in my stash. I had planned to paint the dining room one of them and when I opened the can and actually looked at my mind, I chickened out changed my mind. Frolic is a color that looks AWESOME on the little card. But as my friend Ange discovered, it can be a bit hard to take in large doses. Since I already had the paint and it wasn't a large piece, I figured it would be fine on the shelf. The first two coats in, I was worried. Like really worried. It wasn't looking at all how I wanted. So I added a third coat. This is obviously a work in progress. I'm not at all loving the color. It lacks a certain pizzazz. It pretty much blends right in with the wall. I guess that's what David Bromstad meant when he said organic. I'm thinking of painting the insides of the cubbies a different color to give a bit more contrast. I still have a good half gallon of the paint left. And since the FHA inspector said I couldn't have paint swatches of paint all over the place while I picked colors. I figured it wouldn't hurt to use it in MY laundry room. Even if Ange couldn't stand it in hers. Maybe the secret to making the color tolerable is to add pink? 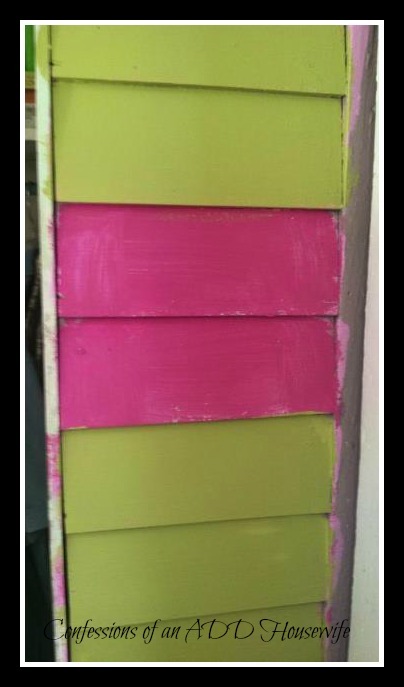 The pink was my first color choice, but I ran out of paint..so I left it as a pink stripe. Since it was in more than one place, it was an intentional contrast in paint colors and the FHA guy didn't say anything. Hot pink or pea green. What fabulous color choices are you making?